Does Europe learn from history? Every now and then I will blog about Central Europe and East Central Europe. This is because I made the documentary ‘A Life in Hungary‘ about almost a century of Hungarian history. The documentary focusses on a woman who in a resilient way coped with the severe system changes of her country. And history repeats……..
Lenin monuments are falling now in Ukraine. Around 100 statues have been toppled in Ukraine. While making my documentary ‘A Life in Hungary‘ about the Hungarian history I visited the Memento Park in Budapest with my Hungarian friend. Here you can find the statues from the communist period. 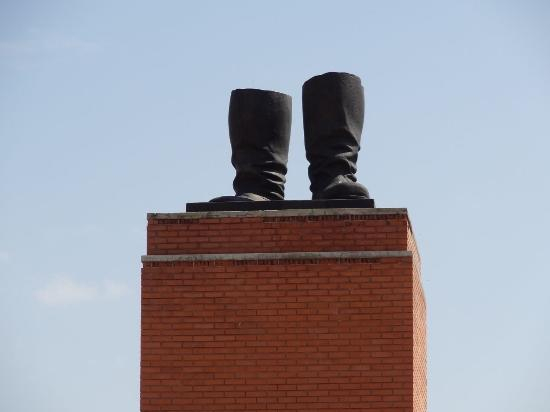 Amongst them Stalin’s shoes. 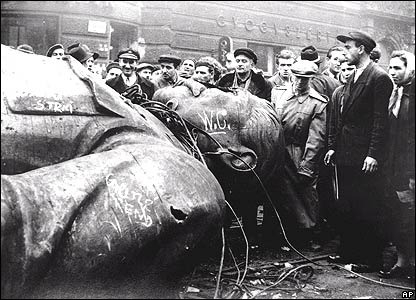 During the Hungarian uprising in 1956 Hungarian revolutionaries demolished the Stalin statue, leaving only his boots. But as you might know the Hungarian uprising didn’t last for long. The uprising started on 23 October 1956. On 4 November a large Soviet force invaded Budapest and other regions of the country. The Hungarian resistance continued until 10 November. The Cold War gave the West European countries the comfort of a relatively stable situation. But the dictatorships in Eastern Europe consolidated. What will Putin do with the Ukraine? The revolution in the Ukraine might be the end of the Russian empire as Timothy Garton Ash states in the Guardian. „With Ukraine, Russia is still an empire; without Ukraine, Russia itself has a chance to become a state-nation. The future of Ukraine is more central to Russia’s national identity than that of Scotland is to England’s. Centuries ago, people who lived in the territory that is now Ukraine were the original Russians. In this century, the people who call themselves Ukrainians will shape the future of what is now Russia.” So there is something at stake. Krushchev knew this in 1956. So how will Putin react? Fortunately some countries would like to prevent the history to repeat. This is a joint Statement of foreign ministers of Visegrad countries (Poland, Czech Republic, the Slovak Republic and Hungary) on Ukraine. Do they have Poznan 1956, Budapest 1956 and Prague 1968 in mind? „Canada threatens sanctions if Russia disrupts peace in Ukraine as U.S. warns sending troops would be ‘grave mistake’” the National Post states. „Ukraine stands on the brink – and Europe must bring it back” is the headline of Timothy Garton Ash’s article in the Guardian yesterday. Is Europe able to learn from history? With the failure of the Hungarian Revolution in 1956 the Cold War became definitively settled. Ironically it gave ‘the West’ a rather stable situation in which it could prosper. The next two articles deal with the Ukraine and entering a Cold War period again. Dmitri Trenin in the Observer (2 March 2014): The crisis in Crimea could lead the world into a second cold war. “This is perhaps the most dangerous point in Europe‘s history since the end of the cold war. Direct confrontation between Russian and Ukrainian forces will draw in the United States, one way or another”. Russia and Ukraine Edging closer to war. The Economist.